Over the summer, RIT announced $12 million in funding from New York state, $3 million from Dell and $12.4 million from Cisco Systems Inc. that will be used to grow MAGIC Spell Studios, a university program that will link RIT’s internationally ranked academic programs with high-tech facilities needed to commercialize computer gaming, film and animation, graphic design and imaging sciences projects. RIT announces investments in MAGIC Spell Studios, aimed at spurring growth of local digital media industry: On July 9, RIT announced $12 million in funding from New York state, $3 million from Dell and $12.4 million from Cisco Systems Inc. that will be used to grow MAGIC Spell Studios. N.Y. consortium wins bid for a multimillion-dollar national photonics center: A New York-based consortium, led by SUNY Polytechnic, RIT and UR, has been awarded a multimillion-dollar federal investment to create a national photonics center. Princeton Review names RIT among best colleges: The education-services company features RIT in the just-published 2016 edition of its annual book The Best 380 Colleges. RIT included in ‘Fiske Guide to Colleges 2016’: Once again, RIT has been selected in the newest Fiske Guide to Colleges due, in part, to RIT’s successful co-op program and diverse campus. New smoking policy limits tobacco use on campus: After two years of debate, RIT has adopted a compromise plan that restricts, but doesn’t prohibit, tobacco use on campus. Turning up the volume on prostate cancer: Professor Hans Schmitthenner is designing molecular imaging compounds that will target prostate cancer cells and light them up with contrast dyes. 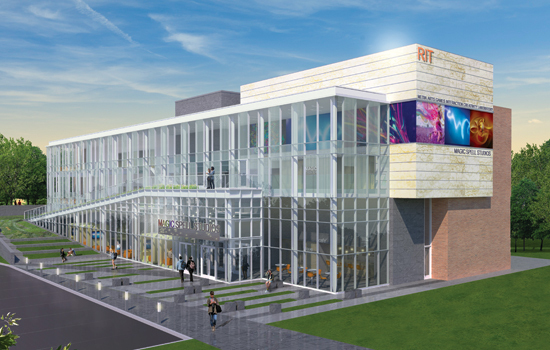 RIT/NTID receives $4 million boost for deaf, hard-of-hearing education: The National Science Foundation awarded $4 million to DeafTEC: Technological Education Center for Deaf and Hard-of-Hearing Students. RIT collaborates with IBM to enhance Cybersecurity Lab: IBM is teaming with RIT to advance education for computing security students by providing software that simulates the real-world experience of today’s cybersecurity threats. Finding a new life: Next-generation industrial robots donated by General Motors to RIT lab: The Fanuc R2000iA/210F robots are used in contemporary manufacturing processes and will be installed in CAST’s Materials Laboratory. RIT imaging science student’s interview makes Reddit front page: Kevin Sacca made social networking website Reddit’s front page on June 16 with his “Ask Me Anything,” or AMA, about multispectral imaging of historical documents. RIT joins the Ellen MacArthur Foundation’s Pioneer University program: The Ellen MacArthur Foundation’s Pioneer Universities are dedicated to accelerating a global transition to a regenerative, circular economy. RIT receives United Way President’s Award for campaign excellence: RIT was honored with the President’s Award for its extraordinary contribution and dedication to the success of the 2015 United Way Campaign in the Greater Rochester community. RIT/NTID inducts students into new Epsilon Pi Tau national honor society: Nineteen students and eight faculty members were recently inducted into NTID’s first national honor society, Epsilon Pi Tau. RIT remembers President Emeritus Paul Miller: Paul Miller, president of RIT from 1969 to 1979, died June 5. He was 98. Miller is credited with managing the relocation of the campus from Rochester to Henrietta. RIT Athletics enjoys an incredible 2014-15 season on the field and in the classroom: The 2014-15 season was arguably the most successful in the history of the RIT athletics program. Whether it was on or off the field, individually, and as teams, RIT reached unparalleled heights.